That's great news, and thanks! Although videos aren't working for me. If anyone figures out why that might be let me know! FYI, the new video preloading option was fixed at one point, but now none of my attached videos are working in my Chrome browser. Also, we really need to have a public link on each attachment tab for opening URLs in a new tab (or a new window) if/when attached links do not display properly within the embedded browser. We know there will always be a small percentage of sites that (for a variety of different reasons) may not display within the embedded browser, and a simple menu option to open the link in a new tab would prevent public brains from being filled with completely dead content. Since this "open in a new tab" option is already available when brain owners are logged in, is there any reason this same option can't be quickly and easily added onto the public tab menu? I agree that there should be an "Open Link in New Tab" capability for all web-link Thoughts/attachments. This gives the user an option if/when a webpage is 'non-compliant' for whatever reason. Also the same functionality as when the "Embed linked web pages" option is turned off and you can click on the link icon. This should always be an available 'button' for all web links. This 'dead content browser' condition is affecting too many random, 'legitimate' websites. This seems it may be an available, easily implemented workaround/fix - please consider. And another recent update to report. Thought Tags can now be hidden in the web client. From your Brain list, click on the hamburger button for the desired Brain and click on Settings. Check the Hide Tags in the Plex box. 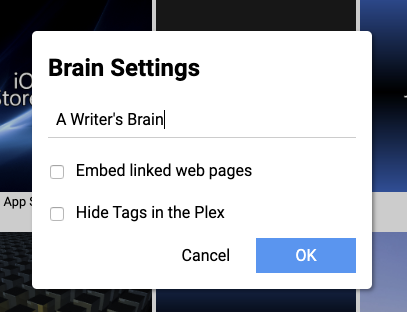 This will be a huge help to those of us sharing public brains -- and I LOVE the fact that when tag links are placed in the notes, tags can still be selectively viewed. This will be perfect for my use case (hiding admin tags and sharing public tags), and I hope it will be immensely helpful to others. Very much appreciate your help in providing this display option. Agreed, this is an excellent step forward!!! I have 1,000+ Tags I want to be able to point people to (through Notes links), without having the Tags appear independently in the Plex. And it sounds like that's what we now have.